We’ve got such grá (love, as Gaeilge, for international listeners) for Northern Ireland… but you knew that already! From walking the streets of Belfast with Caroline Wilson to pulling up a chair at Alison Abernethy’s table in Co. Down, we’ve already documented some of our favourite people in NI food in this podcast; but we’re only getting started. We’ve written about driving along Northern Ireland’s Causeway Coast route (a MUST-DO!) before, but in this episode we took stops along the way to visit some of the Antrim Coast and Glens region’s best food and drink producers – Broighter Gold, Corndale Farm, Lacada Brewery, and Broughgammon Farm. Firstly, we visit Broughgammon Farm just outside Ballycastle where Charlie Cole and his family run a unique farm focusing on kid goat (cabrito) meat, free-range rosé veal and seasonal wild game. Then, continuing westwards we make our way to Limavady, 30 minutes outside Derry and about the same from Coleraine, we chew the fat with Leona Kane who alongside her husband Richard runs Broighter Gold, a family-run arable farm producing the most exceptional rapeseed oil. Gold in both name and nature, this stuff really is liquid gold. Then, a few miles up the coast we navigate the backstreets of picture pretty seaside town Portrush and stumble upon Lacada Brewery, a booming craft beer business which is run as a community co-operative, begun by founding member Laurie Davies who takes us through some of the flavours and how it all started. Then, we conclude at Corndale Farm where Alastair Crown introduces us to his happy, inquisitive and funny free-range pigs and talks to us about the opportunities and challenges of better-than-free-range pork farming and his stunning range of charcuterie, from fennel salami and chilli chorizo to lomo and venison (by way of Broughgammon) salami. 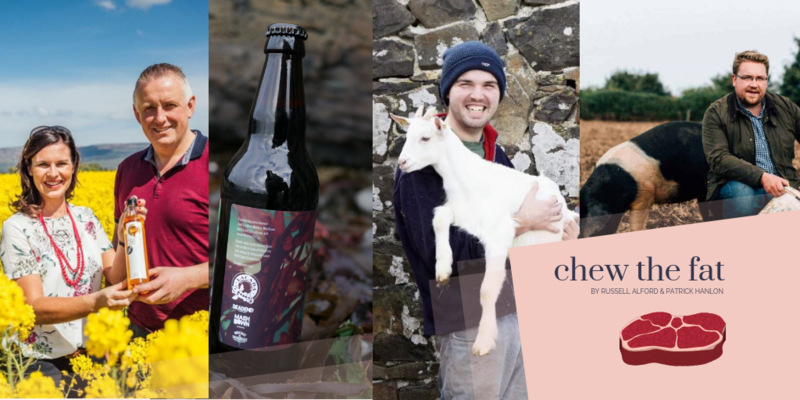 There’s a common thread between all four, even though they have wildly differing products, unique approaches and individual business visions, but a sense of community underpins everything they do and what it comes down to is an undying passion for their produce. It’s tough work for each one of them, challenges are around every corner, but they wouldn’t do it without the love of it – and that shines through in every single word they say. For more on Taste Causeway, visit the Causeway Coast & Glens website.